The Asscher cut is also called the square emerald cut, but it is more bold than the classic rectangular emerald cut. With equal proportions and deeply trimmed corners, an Asscher shape resembles a glittering octagon. The "hall of mirrors" effect reflected in the stone's facets give it a clarity unmatched by other diamond shapes. Is unique proportions are sure to be stunning in any ring design. Click on any ring image for additional details and purchase information. This engagement ring features 1.91 total carat total weight of diamonds. The center stone is an Asscher cut diamond in a rose gold prong setting surrounded by round brilliant cut stones. 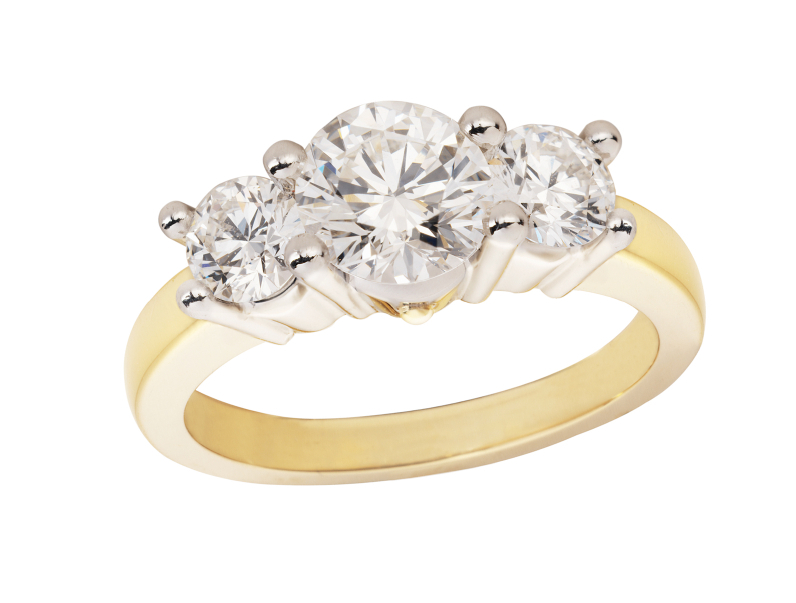 The ring features a split shank diamond band. The ring is priced around $9,500. This engagement ring features an Asscher solitaire in prong setting with a thin white gold band encrusted with small round pave set brilliant diamonds. The ring has a total carat weight of .80 and is priced at about $1500. The center stone of this simple, yet elegant, bridal set is a lovely Asscher cut diamond, surrounded by smaller, colorless diamonds. Both bands feature round-cut diamonds as well as milgrain and filigree detailing. This platinum set features 1.77 carats total weight of diamonds and retails for just under $4,000. This lovely diamond ring features a prong-set center Asscher cut stone surrounded by a semi-halo of baguettes and round diamonds. The lovely rose gold band features tiny pave set diamonds for a total carat weight of 1.81 carats. This ring is priced just under $3,500. This simple, but lovely, ring features a 1.25 total carats of Asscher cut diamonds set in a 18k white gold band. The ring is priced just under $5,000. The center stone of this gorgeous ring is a 1.8 carat Asscher cut diamond set off by a halo of chanel-set, French-cut, blue sapphire accent stones. The ring is priced around $7,000. This elegant, bezel-set Asscher cut ring features a round diamonds on the shank and bullet cut baguettes on each side for a total weight of 1.4ct. Done in white gold, this unique ring is priced at just under $5,000. This 1.5 carat total weight ring features a center Asscher cut stone flanked by a princess cut diamond on each side, in angled kite settings. The band features small, channel set princess cut diamonds. The ring is priced just under $3,000. This lovely bridal set features a 1.78 carat Asscher diamond center stone surrounded by channel set princess cut stones all set in 14k white gold. This set is priced just under $5,500. No matter what design you choose, you're sure to be pleased with the beauty and elegance of an Asscher cut diamond.